We have been in a really nice daily routine of late, but today I kind of threw us off track with my need to clean and a spontaneous project. Daily things with the girls are fun, but definitely tiresome. Am I nervous to throw in that fourth?! Oh you bet ya! 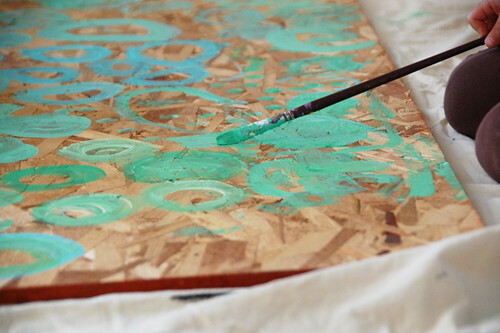 I am so scared as how this will look in my home. There will be a new normal, but it makes me super nervous. Sometimes when Ben gets home, I just want to run out of the house and escape, but with four, oh my sanity will be such a rarity. I really wish there was a chill pill cause I need myself a big dose of that! Know of a doctor who can prescribe me some? As much as they wear me out, it is also a joy. I love watching them play because it is so funny. I see so much of myself and how I use to play as a little girl. 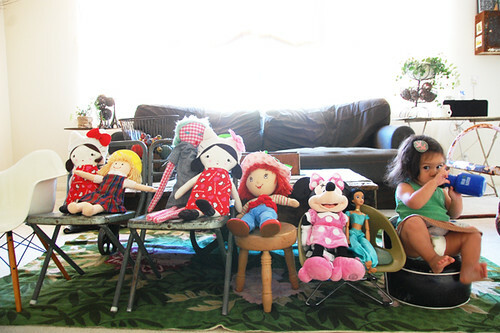 They line up all their dolls on their chairs and put on a show! I totally did that all the time. Can you spot the newest toys in the line up? Yup! That is what happens when they sleepover Grammy and Grumpy's house... a trip to the disney store! Oh me oh my! Good thing I am not a hoarder and purge through toys often. Until then, then will enjoy Minnie and Jasmine until to their hearts' content. I was such a disney lover growing up, so I think it is kind of funny that I don't really buy them disney stuff. I love Disneyland and all, but I really just don't buy them a lot of toys period, unless it is handmade, but even with that, they have so much anyways, they don't need anything! I am glad the work week is shorter because even though it just started, I am looking forward to the weekend. I just like having Ben home! You're such a great mom! I only have two little guys (and I'm done) but my friends that made the jump from three to four said it wasn't so bad. I'll keep you in my prayers! :) I'm also glad this week is shorter...weekends with my husband home are wonderful. we miss you and we want to play soon!!!!! but we will be in maui next week, so maybe once school gets out?!?!?! BIG hugs and kisses to you and your girls and your belly from me and isabelly! i love how soul fits right in as a little "toy"! I admire your patience and creativity with three little ones running around. No doubt you'll be just as wonderful with four! That collection of toys is precious - especially the little cutie on the end! That's funny. As much as I try to only have vintage and handmade dolls for my 21 m.o., her very favorite is the Minnie sent from her Grandpa. Same thing happened with my two boys- they loved Lightning Mcqueen so much more than any of the other things I made for them...sigh, I guess there's no fighting it! first, i'm new to your blog and i just want to say i love it! second of all, i totally agree with you about the stuff factor! i get overwhelmed with trying to give my daughter things she wants without overindulging her with a million things. to many toys leaves no room for imagination! ya know? you'll be great with 4!! best of luck! You're going to have so much fun with your little quartet. I love the Disney store and Disney STUFF! But that's what it is... stuff. I can see myself buying it for grandchildren, but probably not my own kids. Although I have been coveting a Cinderella mug one of my co-workers has for, oh, the past three years!! Haha the disney stands out. What an awesome doll collection!!! I bet you will surprise yourself with four. I kind of think after 3, four doesn't feel all that different. It is just all crazy all the time. The dolls lined up make me smile...we have lego men battles here instead of performances for dolls. Your girls are so sweet.